I recently came across Rolf B. Basle’s build of a Ju-88C-6 on 72nd Scale Aircraft and found that his approach to modeling is similar to mine, and I thought it would be interesting to discuss it here on Scale Model Soup. Many moons ago someone (I don’t remember who) told me this maxim, “Representation, not duplication.” What he was trying to say in that concise statement is that as modelers we generally don’t try to duplicate each and every detail in our models. We try to merely represent the actual aircraft or vehicle in miniature. This is important for several reasons. First, there are technological limitations in the kits we build. For example, we’ll probably never see a canopy produced in actual scale thickness in anything below 1/32 scale. Second, as I’ve come to learn each of us participates in the hobby with the talent and skills we are blessed with (or not blessed with, as the case may be). You may not have the skills to superdetail a cockpit in 1/72 like a Derek Brown or Ken Belisle, so you do the best you can with imperfect results. Finally, as Rolf found in his Ju-88 project, there are likely limitations to the information available to us. Rarely do we have access to enough documentation to make definitive statements in the way a particular airplane was painted or configured at any specific point in time. Those of us who build modern subject matter have more information than others in the hobby, but those of you who spend your time in older genres know the inherent challenges of building a model that is 100 percent accurate. That said, I think we can learn something from academics, who often have to make a more or less definitive statement and defend it with evidence or prove it with a series of logical arguments. That’s exactly what Rolf did. He reviewed the reference material he had, found some of it speculative, and drew his own conclusions based on (what seems to me) to be sound logic. 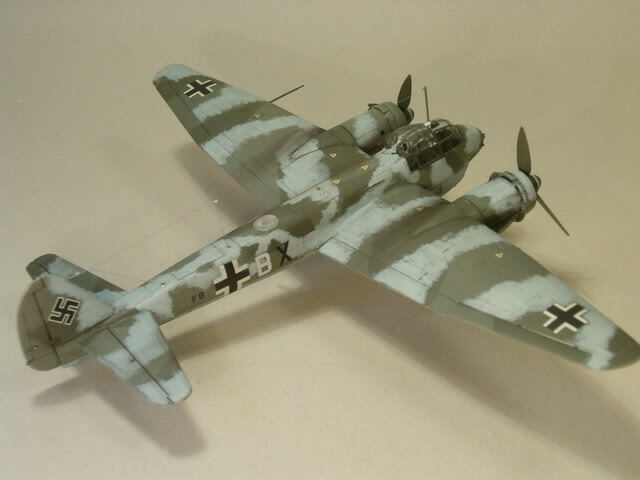 The result is a model that is a solid representation of a Ju-88 of V/KG 40. At the end of the day I hate to think that any of us is withholding a project because we don’t believe we have definitive information to proceed. I encourage you to use your head for something other than a hat rack (as my drill instructor told me in 1986). Don’t be afraid to study the documentation you have and draw your own conclusions. And by the way, Rolf’s execution of the paint scheme on the Ju-88 is outstanding as well! What a great looking model!